A word to the wise: do not attempt to do the readings for your winter school Australian politics course with this album going in the background. You will be forced to stop, jump up, and dance around the room like a right fool if you do. Not that this is any way a problem in and of itself, but it does mean that an essay on the ideology of Kevin Rudd will fall by the wayside. Indeed, not a problem at all. Pala is the sophomore offering from English band, Friendly Fires, whose three members met at St Albans School (which, it can’t not be mentioned, was opened in 948 AD and also educated such notables as Rod Argent, founder of The Zombies, and Stephen Hawking). Some bands distinguish themselves by their wicked riffs, others by their insightful lyrics. In Friendly Fires’ case, their notable talent would be the art of taking a line and making it resonate. Note the line from ‘True Love’: “All I want / Is to feel true love”. Nothing to write home about, right? Not quite. Lead vocalist Ed Macfarlane, with his regal ability to emphasise just the right parts of his lyrics, injects a catchiness into what he sings. This means you will be singing these songs in your head – or out loud if you’re a little braver – well after the album’s forty-four minutes have ended. It would seem that the fourth track, ‘Hawaiian Air’, is being pushed as one of the “singles” of the album, yet the immediate standouts are definitely the first two tracks – ‘Live Those Days Tonight’ and ‘Blue Cassette’ – both intense, pop-tacular dance tidal waves. In fact, this admittedly over-the-top description could accurately be applied to the entire record. However, far from sticking to this formula, the band experiments with other styles as well. ‘Show Me Lights’ and ‘Helpless’ demonstrate tinges of hip hop and r ’n’ b, as does ‘Pala’, a more relaxed number. All contribute well to the record as a whole, and I say this despite my usual aversion to both hip hop and r ’n’ b. In fact, it can be said with confidence that each of the 11 songs here flies well with its fellows. Moreover, Friendly Fires has achieved this cohesiveness without letting in any tedium. While listening to this album, I was reminded of an episode of Black Books – you know the one, where Bernard is dreaming of “a summery girl” who he will ditch when autumn comes, precisely because she is his summer girl. Well, this is your summer record. However, the comparison falls quite flat because when autumn comes you will not want to relinquish Pala; instead, you will fervently deny that summer is over at all. Myself, I almost forgot that it was winter. 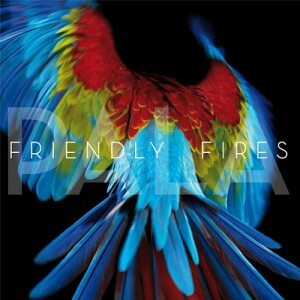 This entry was posted in Music and tagged album review, friendly fires, pala. Bookmark the permalink.